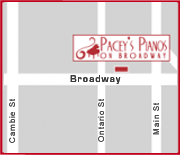 Pacey’s Pianos all of Vancouver Island including Victoria, Nanaimo, Comox and beyond. We can arrange for delivery of any new or used piano and have a qualified local technician service it for you. If you are in Parksville or Tofino, Campbell River or Equimalt, we ave the right piano for you. Brands available to Vancouver Island are Mason & Hamlin, Schulze Pollmann, Knabe, Orange Digital and used Yamaha pianos at outstanding prices and we can deliver almost anywhere. We are the Island piano store.